I guess that it shouldn't really come as too much of a surprise to discover that whoever came up with the bright idea of mixing fundamentally weak Eastern European economies with those of countries like Germany was an inherently flawed idea. If we look at Poland as an example, 60% of Polish mortgages are in Swiss francs. The risk there if you are a Pole is pretty obvious. To join the EU Poland had to keep it's currency stable, this it did by fair means of foul. Your average Pole was all too keen to jump on the bandwagon and take out a low interest mortgage in Swiss francs, and who could blame him? The problem came when the recession hit and the zloty halved in value. You don't need to be Einstein to figure out that that meant if you were a Pole with a Swiss franc mortgage then your repayments doubled, and you fell into arrears and/or defaulted. And this is happening all over Eastern Europe and the Balkan states. And it's not just individuals with mortgages who aren't coughing up. Entire countries are at risk of doing the same. And that has a knock-on effect elsewhere. Some "small" countries like Austria have lent an estimated $1.7 trillion to Eastern European countries who are now in danger of defaulting. In the case of Austria alone EUR230 billion, or 70% of it's GDP. This is where the inherent problem lies. Austria can't nationalise the banks because it hasn't got the money to do so, it is too small relative to the size of the banks it houses. So it needs help from elsewhere. Step forward Germany, who's finance minister Peer Steinbruck has indicated recently that they may have to help bail-out non-German banks. But Germany isn't having such a wonderful time itself. It's own GDP fell 8% in the last quarter and unemployment there is rising. If you were a German would you want your government to use your money to bail-out banks in another country? I bloody well wouldn't. And it's not just the euro and ECB that are in trouble. The UK is one of the countries at greatest risk of widespread bank nationalization outside of Iceland according to bcaresearch.com. March corn finished at $3.50 1/4, down 3 cents. Weather forecasts calling for rains this weekend in crop areas of Argentina weighed some on corn futures. The USDA export sales report for the week ending February 12 came in at a very respectable 1.33mmt. This gave some support to corn, and was at the high end of expected analysts’ range estimates. However, lower crude oil futures among other bearish outside market factors weighed on corn futures. March soybeans closed at $8.62 1/2, down 22 cents. Anti government strikes by Argentine farmers were reported this afternoon. This plus late in the session short covering and a lower US dollar index gave some bullish support, offsetting some earlier losses. The USDA released its export sales report for the week ending February 12. Net sales of US soybean exports were above expectations at 1.094mmt. However, lower crude oil futures among other outside market factors weighed on soy complex. March CBOT wheat settled at $5.19 1/4, down 1/4 cent. Weather forecasts for the HRW wheat crops areas of the southern US Plains calls for little chance for precipitation which is much need in areas affected by recent prolonged dryness. A late in the session short covering and a lower US dollar index provided some bullish support to wheat futures, offsetting some losses. Market sentiment over decreased demand for wheat as a result of the global economic downturn and US recession continued to weigh on wheat futures. The USDA released its export sales report for the week ending February 12. Net sales of US wheat exports were in line with expectations at 433,457mmt. A lower US stock market among other bearish outside market factors weighed on wheat futures throughout the session. EU wheat futures closed lower Friday, with a lack of fundamental news shifting traders attention to the global recession and its possible impact on grain demand. Paris May milling wheat ended down EUR1.75 at EUR141.00/tonne, and London May feed wheat closed down GBP1.50 at GBP112.00/tonne. There is a general lack of export demand around and large old-crop stocks, throw in the current malaise regarding the world economic situation and the market is struggling to see beyond that. We seem to me to be in a situation strangely reminiscent of twelve months ago in my humble opinion. Yet in mirror form. Then if you can recall, and I'm sure you can, pretty much every man & his dog were bullish beyond belief. Crude was going to $200+ for sure and we were on a one-way road to riches. Despite sharply higher plantings and an outlook for increased supplies all round the world feed wheat was £200/tonne. Taxi-driving blokes you knew casually in the pub were asking you about the wheat market. People (in the UK for my continental readers) were going long tapioca at £170, sugar beet at £180 and bloody soya hulls at £150. It was a certainty wasn't it? Erm, well no it wasn't actually was it, crude never did make $200/barrel and the rest as they say is history. So here we are, almost twelve months to the day later, and the boot is well and truly on the other foot. The greyhounds and miniature schnauzers are bearish as hell. There is for sure no way out of this downwards spiral is there, and we are all going to die a slow and painful death. The one thing you can rely on boys when the whole of the world is on the brink of a recession that hasn't been seen since the 1930's is what? That's right GOLD. Gold broke through $1,000/ounce today, very close to its all-time high set last March, and is predicted by some to make $2,000/ounce. I don't know about you, but I don't normally fancy gold when I'm hungry. For me, all the signs are there that grains can easily appreciate substantially from where they are today. They aren't even very difficult to spot, they are all well documented on here. But then again the signs that things were well overcooked twelve months ago weren't that difficult to spot either. The pound is goosed (and the euro too for that matter), world wheat production will be well down - much more so than current "official" predictions, and consumption is not going to fall - despite our appetite for gold. And none of that takes into account a crop disaster somewhere. I'm not saying that today is the bottom of the market or anything as crazy as that mind. And I don't think that they have a Burtons window around here any more, so I may have to be content with Lidl. I feel so much better when virtually nobody agrees with me, I don't know why that should be, but there you go. EU wheat export licenses have been granted for 14 million tonnes of soft wheat (excluding durum) so far this marketing year, an increase of more than 227% from the same point in the marketing year in 2007/08. Thirty four weeks into the marketing campaign that's a rise of a little more than half a million tonnes on last week. Tyson Foods Inc., the worlds largest meat packer, has had its credit rating downgraded by Fitch Ratings, according to media reports. The company's long-term Issuer Default Rating (IDR) is now ’BB’ from ’BB+’ say Fitch. The downgrade is due, they say, to $112 million of consolidated net losses during the most recent quarter ended Dec. 27, 2008 and Fitch’s expectation that a substantial portion of $168 million of grain related hedging losses and $20 million of negative non-cash inventory adjustments will be realized in the near-term. Russian aims to be self-sufficient in pork and poultry production within five years may come in ahead of budget, according to media reports. An un-named Russian official said the country would be able to produce as much poultry meat and possibly as much pork as it needs within about four years, according to Interfax News Agency. First Deputy Prime Minister Viktor Zubkov told a news conference Russia would be able to fill its poultry meat needs "within the next two to three years" and that "we also have a chance to fully provide ourselves with pork within three to four years." He said Russia produced 8 percent more pork and 18 percent more poultry in 2008 than in 2007. Boosting domestic beef production, however, would be a more difficult task. "Beef production is the most difficult part of (Russian) stock raising," he said. "For this reason, the state is beginning to invest federal funds in this industry. This work is planned to take several years," Interfax quoted him as saying. Federal State Statistics Service of the Russian Federation (Rosstat) reported on Thursday that in January 2009 meat production (including by-products of the first grade) totaled to 241 thousand tons, up 11.7% from January 2008. And while pork and poultry production grew by 12.7% (to 40.4 thousand tons) and by 15.1% (to 181 thousand tons) respectively, beef production was down 15.8% to 15.9 thousand tons. It will be interesting to monitor the implications for grain usage in Russia over the next few years in order to fulfil these expansion aims. The canny Russians are never slow to spot an opportunity are they? Negotiations are at an advanced stage according to media reports on a deal that will see Russia supply Brazil with a million tonnes of wheat in exchange for soybeans. Brazil is traditionally a big importer of wheat, and usually takes much of its requirements from neighbouring Argentina. The latter of course have seen their wheat crop decimated by drought this year, and will not be an aggressive exporter in 2009. The US had been hoping to pick up a large chunk of this potentially new business this year. Brazil normally import around 7mmt of wheat a year but their own domestic crop is seen around 3mmt higher this year. The overnight markets are mixed, mostly a little higher Friday morning with soybeans up around 4 cents, wheat a cent or so firmer and corn slightly lower. For wheat there seems to be far more concern developing over drought in the US southern plains than in China. It appears to be a case of the closer to home the problem, the more important it becomes. "The newly released outlook for March shows drying for the Southern Plains, Gulf States and Southeast. Early season row crops may get off to a poor start if this forecast verifies," says Allen Motew of QT Weather. The worst Chinese drought in fifty years has officially been downgraded to level two, with the government now saying that things are no worse than this time last year. They couldn't possibly be lying could they? For soybeans the announcement of a four day strike by Argy farmers last night ahead of talks with the government next Tuesday is obviously supportive. Talk of possible upcoming Chinese cancellations on soybeans will keep traders cautious from getting too carried away to the upside. The USDA will release it's weekly export sales data at 13.30GMT. Here is what is expected: Wheat 250-450,000MT: Corn 850-1,500,000MT; Soybeans 700-850,000MT. Some pretty solid numbers there. I thought there was a recession on? Argy farmers have begun a four day strike ahead of talks with the government scheduled for Feb 24th. Just as in last year's dispute farmers will halt the movement of grains and livestock. The hastily arranged talks are a "ploy" thrown together at the last minute in a transparent attempt to hold them off striking for as long as possible, they say. So they've finally woken up then? Last year's four month long dispute sparked demonstrations, roadblocks and widespread food hoarding. I get a feeling that the dispute will be far more serious this time round. With inflation unofficially running at 30% and reports of up to a million head of cattle lost to drought in the last few months, how much food is there left to hoard in Argentina, and can the public afford it? The chances of anything being resolved anytime soon are probably rather slim as the government need the money they get from export taxes, whether they are fair or not is a different matter. It's a huge source of revenue that they can't afford to let go. It reminds me somewhat of one of those useless management courses you get sent on sometimes. 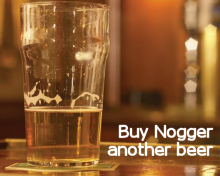 What the hell are you talking about Nogger? Well I got sent on one once, about ten of us went, and we were split into two teams and set a "task" (Wikipedia: task - completely pointless exercise dreamed up to waste time by a "consultant" on a fat hourly rate). The gist of this task was that team one were told that they had a manufacturing company making widgets at a unit cost of say £100/widget. The business was going down the tubes and they needed an order fast. But there was no point in selling below £100/each or they were just losing more money. Team two had a business manufacturing a product that used widgets as a component part. They had a large order on the table for their head product. They too were losing money fast and needed to take this large order to keep going. The only trouble was they'd end up losing money on the deal if they paid us more than £50/widget. We were then put into a room together and told to thrash out a deal. That's pretty much the same brief that the two sides of the Argy dispute have in front of them next week. EU wheat futures closed higher, despite a weak dollar, on concerns over US and Chinese crop conditions. Paris May milling wheat closed up EUR0.50 at EUR143.00/tonne, and London May feed wheat finished up GBP1.75 at GBP114.00/tonne. Despite the pound managing to put in a half-decent day at the office for once, UK wheat futures pushed higher after several days of losses. Worries about drought in the US plains may reduce yields there, with plantings already down quite sharply. Meanwhile, nobody seems to be accurately able to figure out exactly what is going on in China. The official line is, probably quite rightly, treated with some degree of scepticism. If you want to believe what they say, then despite being gripped the worst drought in at least fifty years, crop conditions now are no worse that they were a year ago. Closer to home, all is not looking overly rosy for the UK crop, with some private estimates coming in considerably lower for 2009 than early expectations. Common sense seems to say that a combination of late plantings, lower acreage, reduced inputs and poorer soil conditions will inevitably lead to a much lower crop in 2009. Generally however most estimates don't seem to be showing anything more than a 5-8% reduction. One private estimate I saw yesterday says that this years UK wheat crop will be 14.1mmt, around 2mmt below what the likes of Strategie Grains are currently saying, and around 3.5mmt below 2008's production. March US crude oil futures staged a surprise rally late Thursday after US Energy Dept data showed that crude stocks fell by 138,000 barrels last week, the first decline this year. Analysts had been expecting an increase of more than 3 million barrels. For crude, OPEC production cuts may finally be filtering through to the market, analysts said, adding that falls in output typically take between three to six months to have an effect on stocks data. In contrast gasoline supplies rose by 1.11 million barrels to 218.7 million barrels, whereas a fall of around half a million had been expected. March corn settled at $3.53 1/4, up 4 cents in a rebound from oversold conditions after sharp recent losses. March crude jumped 14% on an unexpected drop in US inventories, whereas a 3.2m barrel increase had been expected. South Korea bought 55,000mt corn overnight, and tomorrow's delayed weekly export sales are expected to show another robust set of figures, after four weeks of 1mmt plus sales. March soybeans dropped 3 cents to close at $8.84 1/2 with a lower US dollar and higher crude oil futures provided bullish support to soy futures, limiting losses. However the outlook for improved crop conditions in South America weighed on futures later in the session. Deferred contracts gained with November soybeans finishing 9 1/4 cents higher at $8.45, as the unwinding of old, new crop spreads was featured. Weekly export sales tomorrow are expected to be strong in the region of 600-900,000mt. March CBOT wheat closed at $5.19 1/2, up 8 1/4 cents. Dryness in the US Plains, a weaker dollar and sharply higher crude lent support throughout the session. Despite China's best protestations to the contrary, there are still concerns over the future of this season's crop there. Taiwan bought an unknown amount of US wheat. Widespread rain and snow over much of Europe maintain favorable soil moisture for dormant to semi-dormant winter grains and oilseeds. 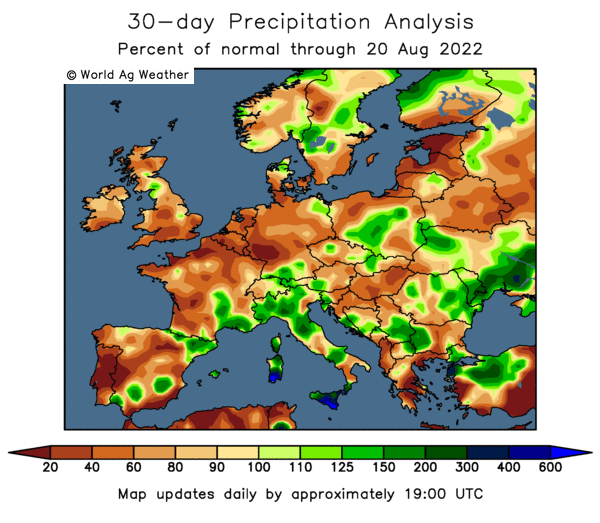 Drier weather returns to Spain in the wake of recent beneficial rainfall. Warmer-than-normal weather in Ukraine and the Southern District in Russia maintains favourable overwintering conditions for winter grains, although most areas lack a protective snow cover. Unseasonably mild weather returns to northern Russia, where winter grains remain insulated by a moderate to deep snow cover. Torrential showers abate in eastern Malaysia, providing much-needed dryness for oil palm harvesting. Heavy showers maintain unfavourably wet conditions for corn in the southeastern Philippines. Showers and thunderstorms benefit heading winter wheat in northern portions of India and Pakistan. 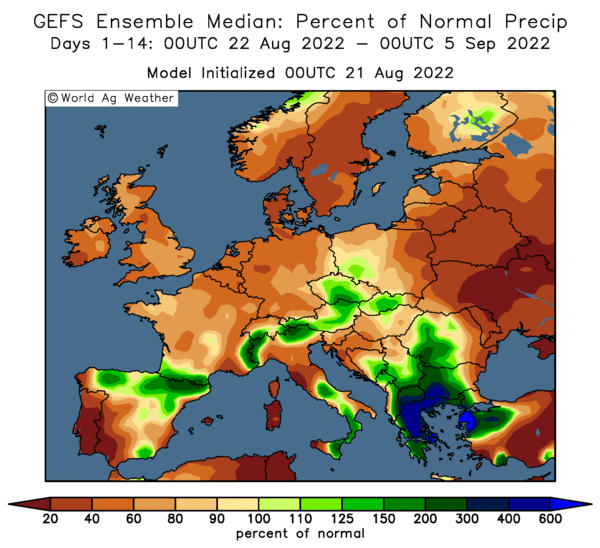 In Turkey and Iran, above-normal temperatures and widespread rain maintain mostly favourable overwintering conditions for dormant to semi-dormant winter wheat and barley. Varying levels of drought stress continue in winter crop areas of Syria and Iraq. Drier weather returns to Morocco and western Algeria, where topsoil moisture remains abundant for vegetative winter wheat and barley. Showers in northern Tunisia provide moisture for winter grains, following a drier-than-normal start to the rainy season. In southern Queensland and northern New South Wales, widespread, soaking rains provide a welcome boost in moisture supplies for reproductive cotton and sorghum. In Argentina, warm, dry weather renews stress on summer grains and oilseeds in La Pampa and Buenos Aires. However, rain brings further drought improvement to Santa Fe and Entre Rios. Beneficial rain covers nearly all major growing areas of central and southern Brazil, increasing moisture for immature soybeans and other summer crops. Conditions remain overall favourable for corn and other summer crops, advancing through reproduction. Spain, typically the main export destination for UK wheat, has reduced it's winter plantings of soft wheat by 11.7% to 1.36m ha from 1.54m ha a year ago. Total area given over to all grains is reduced by 7% to 5.7m ha (last year 6.1m), says the country's Agriculture Ministry. Due to it's unpredictable climate grain production in Spain varies quite wildly, yielding anything from 14-24mmt in recent years. Even with a bumper crop in 2007/08 the country still needed to import 12mmt of grain. The eCBOT market is modestly higher Thursday morning supported by new that Argentine farmers will stage a rally in Cordoba on Feb 20th, after Argy president Cristina Fernandez said that the government will not be budging on the issue of export tax repeals on grains. Indeed Fernandez went some way towards admitting that the country had little option as it was far too heavily reliant in the taxes to do anything else but press ahead with them. The taxes are "an essential part of the country's economic balance," she is quoted as saying Wednesday. A repeat of last years four month long dispute looks like it could be on the cards, which will certainly disrupt grain supplies and probably adding a bit of front-end premium. Japan bought 117,000mt of milling wheat in a tender overnight, with 75,000mt of it US origin. Syria, Iraq, South Korea, Pakistan, Bangladesh, Egypt and the Philippines are all in the market for wheat too. Congestion at the ports is said to be putting Australia out of the equation until at least April. Still, Russia seems to have any quantity and any quality you want at heavily discounted prices. China continues to play down the effects of drought on it's wheat crop this year, saying that rain and irrigation over the last couple of weeks has seen the area affected fall by two-thirds. On the other hand it has also said that it will buy up to 10mmt of corn on the domestic market between now and the end of April to boost reserves and support prices. Crude oil is flat around $35/barrel ahead of today's delayed stocks data from the US Energy Dept., those figures are expected to show stocks rising by more than 3 million barrels. The pound is up against both the dollar and euro in early trade, so I guess we will see London wheat open lower again later this morning. The Argentine Agricultural Secretariat has cut it's forecast for the 2009 sunseed crop to 2.4mmt, from last month's estimate of 2.5-3.0mmt. That is now almost half of production in 2008 of 4.65mmt, and considerably lower than the USDA's most recent estimate of 3.0mmt. Corn output has also been severely cut back, to 12.5-13.8mmt from 20.5mmt last season. Fully 28% of this season's crop has already been given up to pasture as potential yields were so low as not to warrant harvesting they said. Recent rains may however have come just in time to save the recently planted soybean crop, they added. The threat of industrial action by Argentine farmers seems to be drawing ever nearer as the realisation sinks in that the government there is simply employing delaying tactics to avoid a repetition of last years dispute. Foxy Argy president Fernandez knows that she simply cannot give in to farmers demands. Firstly, it would make for extremely bad press, but secondly and far more importantly, the Argy government is far too heavily reliant on taxes on grain exports to reduce them. Argentine Agrarian Federation President Eduardo Buzzi, who it is said harbours strong political ambitions of his own, told reporters Wednesday that "time has run out." Farm leaders called off a proposed strike last week in favour of one more crack at talks with the government. Surely by now they must realise that they are banging their heads against a brick wall? Fernandez might be a hot babe compared to Maggie Thatcher, but then again Mrs Nogger #1 was a hot babe compared to Maggie Thatcher, but she is still a politician - and a female one at that. Therefore, by definition, she is possibly not unaware of how to string a man along with a bit of a storyline whilst comfortably removing his trousers. It's high time that Buzzi woke up & inhaled the coffee. A farmers rally is planed for Feb 20th in Cordoba. And guess what? Planting of double cropped soybeans is now complete leaving farmers nothing much to do until April/May, funny that isn't it? EU Wheat: All The Patients Are Sick, Who Is Going To Die First? EU wheat futures closed lower amidst a general air of despondency and depression. Paris March milling wheat ended down EUR2.25 at EUR141.75/tonne, and London May feed wheat closed down GBP1.25 at GBP112.25/tonne. A dearth of fresh positive news for wheat, combined with another day of "bad news" was sufficient to drag futures into negative territory with harvesting in Pakistan and India only days away. Russia remains the most aggressive seller in town, with what seems to be an almost inexhaustible supply of wheat to service any export order going. The ongoing crisis in the financial markets is again weighing on agri futures as investors lose their appetite to put money into just about anything. Talk of various EU countries requiring further massive financial assistance, and possibly even going bust are keeping the markets very nervous and cautious. The best hope for EU wheat in the near term is a wholesale weakening of the pound and euro against the dollar. And that is certainly not out of the question. All the patients are sick, the question now is who is going to die first? March corn futures settled unchanged; while December corn futures settled slightly lower this session. Market sentiment over declining corn feed usage for livestock and poultry as a result of a growing global economic slowdown and US recession weighed on corn futures for the day. An example of decreased feed use was concerns that US fed cattle supplies may be at a 5-year low. This provided pressure to corn futures. A higher US dollar index this session added pressure to corn. Higher crude oil futures earlier this session gave support to corn, but later crude oil futures traded in negative territory thus provided bearish pressure to corn. Earlier today, Taiwan Sugar reported to buy US corn. Cash corn bids were steady to firm late on Tuesday with slow farmer selling. March corn settled at $3.49 1/4, unchanged. March soy complex finished lower in today’s session. November contracts finished lower as well. Bearish pressure to the soy complex came from continuing market sentiment over the growing global economic slowdown and US recession and improved soy crop weather conditions in Argentina. A higher US dollar index this session added pressure to soy. Higher crude oil futures earlier this session gave support to soy, but crude oil futures after midday traded in negative territory, thus provided bearish pressure to the soy complex. Decreasing demand over soy meal for livestock and poultry feed weighed on soy meal futures. Concerns over the effects of the global economic downturn and lower crude oil futures in the afternoon session gave pressure to soy oil. Earlier today, Taiwan Sugar reported to buy US soy. Cash soy bids were steady to firm late on Tuesday with slow farmer selling. March soybeans finished at $8.87 ½, down 15 1/2 cents. March wheat futures at all three grain exchanges closed slightly lower for the day. Like corn and soy, the market sentiment over demand for wheat as a negative effect of the growing global economic slowdown and US recession weighed on wheat. Spillover from corn and soybeans provided pressure to wheat futures this session. A higher US dollar index during wheat trading gave pressure to wheat. A positive session in the US stock markets provided bullish outside market support to wheat. Additional support to wheat came from weather concerns that more rain is needed in the HRW wheat crop areas in the US Plains. Rising competition from Russian and Australian wheat exports provided added bearish pressure to US wheat. Paris milling wheat futures were lower for the day which gave some light support to US wheat futures. March CBOT wheat closed at $5.10 3/4, down 4 3/4 cents. I've created a nifty little Nogger's Blog toolbar for you to download. If Big Brother will let you of course. Effectively it plugs in to your existing browser, Internet Explorer, Firefox etc, and displays the latest headlines from the Blog so you need never miss another thing, even when browsing other sites. It's free and easy to install too. eCBOT grains closed lower with March beans down 4c at $8.99; March wheat down 4 3/4c at $5.10 3/4 and March corn 1c lower at $3.48 1/4. Fears that the world-wide financial meltdown will curb demand for grains is overshadowing all else at the moment. Recent rains in Argentina and the promise of more to come appears to have stabilised crop conditions there. Between Thursday and Monday 70% of Argy crop areas will receive rains of an inch or more according to Allen Motew of QT Weather. Although there are still worries about China, their wheat crop won't be harvested until June, there are more pressing matters closer to hand than that. At least that is the way the market seems to be thinking at the moment. Attention is already starting to focus on US farmers' planting ideas for new crop. For soybeans you can expect anything from 3 to 6 million more acres, maybe even more. Crude oil is below $35/barrel, and US stocks are expected to rise in excess of 3 million barrels in tomorrows Energy Dept report. Also out tomorrow will be US weekly export sales. The mood the market seems to be in today they'd better be good. Even if they are, they'll probably only provide minor support. The Philippines bought 60,000 tonnes of US corn for March shipment overnight. In outside market news GM and Chrysler are back with their hands out, and cutting 50,000 jobs to boot. GM wants $16.6 billion and Chrysler $5 billion. Meanwhile more money is needed in Europe to fund the fabled "quantitative easing" - if you want to buy shares in anything find out who makes the paper for the BOE and ECB. They could be getting a nice order soon. Early calls for this afternoon's CBOT session: March corn called steady to 3 cents lower; March soybeans called 2 to 5 cents lower; March CBOT wheat called 3 to 6 cents lower. Data from the US Energy Information Administration released yesterday says that the average retail price of gasoline rose to a three month high of $1.96/gallon yesterday. The news comes despite crude oil slumping below $35/barrel, and is because US refineries are cutting back on production due to falling demand, according to the EIA. Pump prices for gasoline in the US are now at their highest since November 17th, the last time prices were above $2/gallon. Energy Dept. data due tomorrow is expected to show gasoline supplies fell 300,000 barrels in the week ended Feb. 13. Crude oil inventories however are expected 3.2 million barrels higher. The global financial crisis could be entering a 'new and more treacherous phase', which could push international countries to the brink of failure and further hinder the global economic recovery, according to Hennessee Group. Charles Gradante, co-founder of the Hennessee Group, points out that Iceland had one of the highest standards of living in the world just a few months ago, but after experiencing the fastest economic collapse in history, it is suffering from soaring unemployment as well as double digit interest rates and inflation. Hennessee Group says there are other countries that share some of the same characteristics as Iceland, particularly with regards to its debt to economic output, and could be vulnerable to the same devastating effects of the financial crisis. It believes it is imperative that world leaders pursue the appropriate policies to stimulate trade and promote worldwide growth so it does not enter a global economic crisis similar to that of the 1930's. After privatising the banking sector in 2000, Iceland's banks went from being largely domestic lenders to major international financial intermediaries with foreign assets worth nearly ten times the country's GDP. As the banks dramatically expanded overseas and foreign money poured into the country, the Icelandic economy experienced exceptional growth and prosperity. Iceland was considered in 2007 to be one of the richest per capita countries in the world. However, as the global financial crisis picked up steam, it exposed the weakness and dependence of Iceland's economy on the banking sector, as well as its vulnerability to a staggering economic collapse. Hennessee Group Research believes a primary contributor to the rise and fall of Iceland's economy was the vast size the country's financial sector grew relative to its GDP and fiscal capacity. As the markets seized up, Iceland's banks started to collapse under the heap of foreign debt they took on over the years. As concerns mounted about the stability of Iceland's banks, foreign investors fled the country, prompting the value of its currency to drop nearly 50 per cent in just one week. The collapse of the currency left banks and citizens with loans originated in foreign currencies in a very tenuous situation; the weakening currency led to their debt obligations nearly doubling. As the nation's economic crisis deepened, unemployment rose from one per cent to ten per cent, inflation soared to nearly 18 per cent and the stock market lost approximately 90 per cent of its value. Hennessee Group Research believes that while Iceland's circumstances were unique in many ways, there are countries suffering from similar risks which could leave them just as vulnerable in the current crisis. One particular statistic of concern is the large amounts of external debt certain countries are currently carrying relative to the size of their economy (GDP) and will continue to build as they battle the economic slowdown. While the there has been a lot of discussion regarding the mounting debt of the US due to recently implemented bailout programs and stimulus packages, Hennessee Group Research believes the US appears relatively stable in comparison to their international counterparts. Currently, the US debt to GDP ratio is approximately 100 per cent with the bulk of its external debt mostly in dollars. The Netherlands currently has a ratio of approximately 328 per cent, while Ireland has built a debt to GDP ratio of 900 per cent. However, the two countries that appear most susceptible to an economic collapse are the UK and Switzerland. The UK's debt to GDP ratio is currently 456 per cent while Switzerland's is 433 per cent. The Hennessee Group believes if either country were to experience a crisis of confidence whereby investors flee the country for safer havens, their currencies could experience a crash similar to that of Iceland's and leaving them potentially insolvent. Phil Spencer of Channel 4's Location, Location, Location has seen his property company Garrington Home Finders fall into administration, another victim of the economic recession. "The correction in the housing market continues to unfold with unprecedented speed," he said. "Nobody can know how long this thing is going to take to turn around," he added. A bit like Kirstie then? Harsh. Would You Bailout The PIGS? It seems like you can pretty much largely forget the fundamentals for the time being. We are unfortunately back in the grip of an ever-worsening credit crisis, and that seems to be all the market can focus on for the time being. The euro nations are in serious trouble and in danger of not being able to ride this one out. It was always going to be a potentially explosive mix, putting countries with economies so diverse together. For the record the sixteen members of the Eurozone are: Austria, Belgium, Cyprus, Finland, France, Germany, Greece, Ireland, Italy, Luxembourg, Malta, the Netherlands, Portugal, Slovakia, Slovenia, and Spain. It's one thing bailing out your own country, it's another entirely bailing out somebody elses. For the euro it may be a case of the first crisis is one crisis too many. At one end you have, the highly disciplined, but also slow growing, economies of Germany. And at the other end you find the faster growing but poorly disciplined countries such as Spain and Greece. As icing on the cake, you also have, countries that lack in both departments, such as Italy. As Al Murray would say, you'd never sell that flat with that lot living next door would you? It seems that the relative good times enjoyed by all since the euro's inception ten years ago, have simply papered over the cracks. During this time the PIGS appear to have made little effort to discipline themselves over debt. Greece is clearly facing the biggest challenge. Public debt, which currently stands at about 95% of GDP, will grow to a whopping 555% of GDP by 2050 if the current pension and social security programme is left unchanged. German Finance Minister Peer Steinbrueck now says that euro-region countries may be forced to bail out other members of the 16-nation bloc that face problems refinancing their debt. Imagine the uproar here in the UK if we were in that situation. Things are bad enough for Gordon McBroon already. What are the alternatives? Let euro members default on their debt? Break the party up and tell the PIGS to sort their own mess out? Or carry on printing more money like Zimbabwe? Whichever way, "make your mind up time" is rapidly approaching. Dow Jones is carrying a news report today that says Chinese wheat production will be down 10% this year "in a best case scenario" going on to say that irrigation can only help 60-70% of the crop. The story goes on to say that China had 30 million tonnes of wheat stocks at the end of 2008. Thirty million? It was supposed to be sixty million a few weeks ago, I wouldn't like to use that store would you? A smaller planted area for the coming season already lops around 5-6mmt of production off last season's output of 112.5mmt. Knock off another 10-12mmt in our "best case" scenario and we are looking at dipping into our comfort-zone by around 15-17mmt. That's 45-47mmt of Chinese wheat disappeared off the table in a best case scenario! Nobody seems to be reporting what the worst case scenario might be. With further crop losses expected from reduced inputs, cold, pests and a serious outbreak of stripe rust a 20% crop loss would wipe out the entire Chinese buffer stocks completely. And that is if they are really there. Just suppose that China's wheat stocks are really just another giant Ponzi scheme? They've always had plenty of buffer stocks, they've been building them for years. Everybody knows that, right? Without them to rely on, one bad crop year would turn into a disaster. Like with Bernie Madoff, you don't know there's a problem until you start to make withdrawals. Suddenly sending out soldiers, armed police and militia to "help" with irrigation relief doesn't seem like such a strange move after all. And if the wheat stocks aren't really there, what about corn & soybeans? The pound is sharply lower after a report in the Telegraph said that the UK's AAA credit rating may be revised by rating agency Standard & Poor. With the UK set to borrow $500 billion over the next five years, taking national debt above $1 trillion for the first time ever, interest payments would soar should the UK's credit rating be downgraded. However, there is little fresh news in the Telegraph story, which may prompt denials later on in the session. Nevertheless, GBP sentiment has soured since the market reacted to the headline, which forced Cable from 1.4300 down to 1.4150 lows. Paris March milling wheat closed down EUR3.75 at EUR144/tonne, and London May feed wheat closed down GBP3 at GBP113.50/tonne Tuesday dragged down by sharply lower outside markets. Weaker crude oil and falling equities weighed on LIFFE markets from the outset with the FTSE and French CAC falling around 2.5-3.0% led by renewed financial concerns. Export interest remains scant with Egypt buying Russian wheat last week, and a Syrian tender for 200,000mt this week likely to go the same way. Drought problems in China and the US are being pushed into the background with attention focusing on near-term financial difficulties. March soybeans fell 52 1/2 cents to close at $9.03/bushel. Beans have now moved from Monday's high of $10.60 to today's low of $8.99 within a week and a day. A stronger dollar, weaker crude, falling equities and forecast heavy rains for Argentina weighed on the market from the outset. March corn ended down 14 cents to $3.49 1/4 per bushel weighed down by outside markets and spillover weakness from soybeans. Rain in Argentina may come too late to help corn but for the time being that doesn't matter. The market is trading on adrenalin, and fear is in the air. Stock markets, weakness in Eastern European financial institutions and how much "medicine" the Japanese Finance Minister has consumed are driving the market for the time being. March wheat lost 20 cents to close at $5.15 1/2 per bushel, largely dragged down by declining soybeans & corn. Weak export demand, a firmer freight market, and a strong dollar combined to send wheat into negative territory. Potential crop losses in the US and China got pushed into the background in a bloody session where outside markets also combines to weigh on grains. Russian grain exports for the current marketing year (started July 1) stood at 13.572mmt up to Feb. 13 according to the Agriculture Ministry, around double the amount exported in the previous year. The vast majority of these exports, almost 12mmt, was wheat the Ministry said. The country expects to export 20-25mmt of grain during the current marketing year, compared to 12.754mmt twelve months previously. eCBOT futures closed the overnight session sharply lower on heavy potentially "drought-busting" rains forecast for much of Argentina at the end of the week. Rain at this stage is seen mostly aiding soybeans rather than corn or sunflowers. Beans subsequently closed the overnight session with losses of around 17 cents, with corn around 3 cents lower and wheat down around 6 cents. Crude oil remains in the doldrums at $37.20/barrel, which is also depressing the grains markets. As is the dollar hitting a two-month high against the euro. On the wheat front Japan is tendering for 117,000mt of mostly US wheat whilst Syria is in the market for 200,000mt of milling wheat, probably Russian grain will fill that order. Drought concerns persist in China, possibly wiping out as much as 20mmt of wheat crops in the world's largest producing nation. 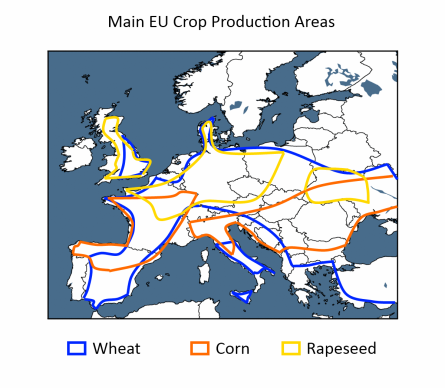 Meanwhile it remains to be seen how wheat in the EU-27 and US come out of winter dormancy. Early calls for this afternoon's CBOT session: Corn 2 to 4 lower; soybeans 17 to 20 lower; wheat 6 to 8 lower. India, the second largest wheat producing nation in the world after China, is seen producing slightly less of the grain in 2009 than previously thought. Singapore-based Agrocorp International say that production this year will come in at 76.5mmt, 2mmt below output in 2008, as some heat stress in December and January has trimmed yields slightly. India's farm ministry had said that it expected production to come in roughly equivalent to last season, but has now pegged final output at 77.8mmt. Harvesting starts in March and is usually completed by the end of April. Neighbouring Bangladesh meanwhile is expecting an unchanged harvest of around 1mmt this year, but says it will likely step up imports to around 2mmt due to lower world prices. Oil World has trimmed its estimates for 2009 soybean production in South America following persistent drought problems for the region. Argentine production is now seen at 43mmt, similar to the USDA figure last week, down from 44mmt estimated last month, and 46.2mmt a year ago. Brazilian output has been trimmed 0.5mmt to 57mmt, 3mmt below 2008. According to the China Daily: The area of farmland affected by severe drought in North China has fallen by more than a third from its peak on Feb 7 to just under 100 million mu (6.6 million hectares) yesterday, the Office of State Flood Control and Drought Relief Headquarters said, as authorities continue to go all out to fight the country's worst drought for decades. Adding that: "Henan, the hardest-hit province and the country's breadbasket, has sent 20,000 soldiers and armed police, and 910,000 local militia to help with the relief work." That's odd isn't it, sending in armed police and local militia to help with relief work? Why would they want/need to do that? Is there something they aren't telling us? I have this mental image of armed police running around with guns "encouraging" farmers who can't afford it to water and fertilise their crops rather than abandon them to drought. "The ongoing drought conditions means farmers have to work much harder. But this is against their economic interests compared with the option of becoming migrant workers in cities," said Zhou Li, an agriculture professor with Renmin University. "Effective agricultural infrastructure can't be built by women, seniors and children, who are just about the only people left in the villages as most of the adult labour is away. "Even those who are temporarily staying in their rural homes because of the financial crisis have for the most part lost their capacity or willingness to do farm work," Zhou said. Ah, it's all becoming clearer now, my mental image might not be as far from the truth as you may think. The Ukraine will harvest 45 mln tons of grains in 2009, according to Yuri Melnik, the Minister of Agrarian Policy of Ukraine. This is a 15.5% drop from output of 53.3mmt in 2008. The harvest will depend a lot on weather conditions, added the Minister. The Ministry have yet to put a figure on wheat production for the coming season, but private estimates peg output around 18-20mmt compared to 25.9mmt in 2008. The pound and the euro both fell against the dollar in early trade Tuesday, with the euro plumbing to a ten week low of 1.2603 against the greenback. Moody’s Investors Services said that they might downgrade banks with heavy involvement in Eastern Europe as the financial turmoil in the market worsens. They might want to take a look at Ireland as well, with talk in the papers over the weekend of bank defaults there not being out of the question. The yen is also down the tubes after video footage of Japan’s Finance Minister Shoichi Nakagawa falling asleep in front of the TV cameras at the G7 meeting over the weekend. Nakagawa said he'd taken too much "medicine" but offered his resignation anyway. The pound is down ahead of a report which is likely to show UK inflation continuing to slow, giving the BoE one more excuse to drop interest rates to a half percent at the next MPC meeting in March. The overnight grains are mostly lower after a long weekend in the US, with soybeans leading the way. US farmers will plant 5% more soybeans and 2.4% less corn this spring according to a survey by ArgriSource. A stronger dollar and weaker crude oil are also bearish influences this morning. Heavy rains may arrive in Argentina by the end of the week according to QT weather. Whilst these may be too late for much of the corn crop, they could certainly add a bit of extra production onto soybeans. January expectations for a crop under 40mmt seem to have disappeared with most analysts now predicting a crop in the region of 41-43mmt. China's wheat crop remains at risk from drought, but you can now throw frost, rust and insects into the mix, according to media reports this morning. ABARE upped their estimate for the final output of this season's Australian wheat crop to 21.4mmt. Syria is tendering to 200,000mt soft milling wheat, with Russia the likely favourite to get the order. Argentina has a big rain event looming on the horizon, says Allen Motew of QT Weather. Temperatures will average above normal for yet another week but rainfall now shown for Thursday or Friday may become exceptionally heavy - potentially even “drought-busting” says Allen. Sunday rainfall was limited and not as much as predicted over East Argentina. Amounts were 0.10-0.50 inches with 30% coverage. On Monday, coverage expanded to 0.10-0.60 inches over 40% of the soybean country. The week ahead will be interesting as the NOGAPS model brings rain to both the south and north with the heaviest in “corn country” across the south while the GFS limits coverage to “bean country” across central regions bringing heavy to excessive totals of as much as two to eight inches! Both models bring above normal temperatures with maximum readings well into the 90’s F, says Allen. EU wheat futures closed lower Monday in an uneventful session as America was closed for the Presidents' Day holiday. Paris March milling wheat ended down EUR0.50 at EUR147.75/tonne, and London May feed wheat finished down GBP1.50 at GBP116.50/tonne. Egypt bought Russian wheat late last week, passing on more expensive French material. Farmers remain relatively light sellers, but Black Sea grain is the cheapest shop in town, with first hand sellers there not quite so reticent. Whilst plentiful supplies of old-crop wheat remain on the market it is difficult to imagine prices rising too much from here. New-crop however could be a different kettle of fish. We've already had one crop disaster in Argentina, and seem to be potentially heading for another in China. If weather in Australia was to return true to type at the back-end of 2009 then the supply side of the coin could look rather different. In addition to that lot, the US crop isn't out of the woods yet, ditto Europe and Russia. Interior Minister Florencia Randazzo, on Saturday said President Christina Fernandez de Kirchner is willing to meet with the farm leaders of the Liaison Committee in the nest few days. The Liaison Committee, which links together the four main farm organization of Argentina, said on Sunday morning that they had not been contacted by the government to open talks. Eduardo Buzzi, head of the Small Farmers Association (FAA) said, "We have asked for a meeting with the President in November, December, January and now in February, yet we have received no answer from the government." The Liaison Committee may already be regretting Thursday's decision to postpone any industrial action and lockout of export farm goods, ahead of the proposed talks. I wonder how long it will be before they realise that they are just being strung along? April 1st any good for you Mr. Buzzi? As the Chinese drought continues into its fourth month, there is still little in the way of natural relief in sight. Meanwhile, fingers are starting to point at a government responsible for woefully inadequate irrigation systems. On Feb 7, Henan province had its first rainfall for 110 days - just 6 mm. During February and March, a crucial time that can dictate the success of a June harvest, crops needed 30 mm, said Zhu Mengzhou, deputy director of the province's agricultural bureau. "If the drought continues, we may lose at least 25 percent of the production this year," he added. Wheat fields in central plain areas, especially those near water resources such as reservoirs, aqueducts, rivers and wells, have been irrigated effectively. But the 28 million mu in the western uplands has been difficult to reach. "We endeavor to dig wells, divert water from rivers and organize people to transport water to relieve the drought," said Yu Hequn, vice-deputy director of Henan's irrigation bureau. But some land cannot be helped, he explained: "The cost is too much. The irrigation facilities, most built in 1960s, are out of order. Farmers have nothing to do but rely on rain." Lloyds Banking Group shares are under pressure again this morning, having already fallen by a third on Friday after it was reveled that massive losses at subsidiary HBOS threaten to bring the bank to its knees. Shares in the beleaguered bank fell as much as 22% in early trade Monday morning. Lloyds only took over, sorry merged with, HBOS in January in a hastily arranged deal brokered by our very own knight in shining tartan armour Gordon McBroon. What a pig-in-a-poke that is turning out to be. Bruno Waterfield of the London Daily Telegraph reports to have seen an eyes-only document prepared by the European Commission for the finance ministers of the various EU member countries. The problem revealed in the report is an estimated write-down by European banks in the range of 16 trillion pounds, or about $25 trillion dollars! The concern is that bailing out the various national banks for such an unbelievable amount would push the cost of government borrowing to much higher levels than we see today. As my kids would say, "Really, Dad, you think so?" Europe is somewhat larger than the US, so think what my gold-bug friends would say if the US decided to borrow $25 trillion to bail out US banks. The dollar would be crucified! The euro is going to get a lot weaker if bank problems are even half of what the report says they are. The British pound sterling is already off almost 30% and, depending on what the real damage is to their banking system, it could get worse. Waterfield reports, "National leaders and EU officials share fears that a second bank bail-out in Europe will raise government borrowing at a time when investors -- particularly those who lend money to European governments -- have growing doubts over the ability of countries such as Spain, Greece, Portugal, Ireland, Italy and Britain to pay it back. "The Commission figure is significant because of the role EU officials will play in devising rules to evaluate 'toxic' bank assets later this month. New moves to bail out banks will be discussed at an emergency EU summit at the end of February. The EU is deeply worried at widening spreads on bonds sold by different European countries." Part of the problem is that European banks were far more highly leveraged than US banks. Some banks were reportedly leveraged 50:1. And they lent money to Eastern European projects and businesses which are now facing severe financial strain and plummeting local currencies. Let that number rattle around in your head for a moment: $25 trillion. Even $5 trillion would be daunting. But the problem is that Europe does not have a central bank that can step in and selectively save banks from one country without taking on all euro zone member-country banks. Yet, as noted above, some countries may not have the wherewithal to save their own banks. It is reported that some Austrian banks are hoping that Germany will step in and help them. Given Germany's problems, they may have a long wait. The Chinese Office of State Flood Control and Drought Relief Headquarters said that, as of Sunday, 6.9 million hectares of agricultural land is under stress from the drought gripping the country. Of this acreage, 5.9m ha is planted with wheat, they said. At its peak earlier in the month around 10m ha of wheat was said to be threatened by drought. Even so, 5.9m ha sounds like a lot of wheat to me. Almost 22,780 square miles of it to be precise. Or an area equivalent to almost half of England. Paris March milling wheat ended down EUR0.75 at EUR148.25/tonne, with London May feed wheat closing down GBP1.25 at GBP118.00/tonne. New crop months were mostly flat to a bit steadier. Export interest in EU wheat has dried up a little the last few weeks, and stocks remain large. Still, concerns over crop prospects in China and the US are providing the market with some degree of support. America is closed Monday for the Presidents Day holiday, which will likely result in a subdued session in Europe to start the week. March soybeans finished 13 cents lower at $9.55 1/2. Rains again this past week in Argentina have stabilised the crop there, with the Buenos Aires Cereals Exchange saying Friday that the soybean crop would come in at 40mmt, better than last week's prediction of 36.35 to 40mmt. Recession worries also weighed on the demand outlook for beans despite another round of robust export sales Thursday. March corn ended down 3 cents at $3.63 1/4 per bushel ahead of a three-day weekend with the markets closed Monday for Presidents Day. An improved weather outlook for South America next week and the Buenos Aires Cereals Exchange upping their production estimate slightly from 12.3 to 13.7mmt to 14mmt weighed on corn. March wheat fell 3 1/4 cents to $5.35 1/2 on spillover weakness from soybeans and corn. There are still some crop concerns around for China, and also in the US too. Unlike corn & soybeans, US wheat sales have only been bumbling along recently. The Argy sunflower crop looks like it has taken a severe pasting from the drought. Planting sunflowers begins in September/October in northern provinces like Chaco, before moving onto southern areas like Buenos Aries and La Pampa. Harvesting begins in the north February, and is usually pretty much wrapped up in southern areas by the end of April. 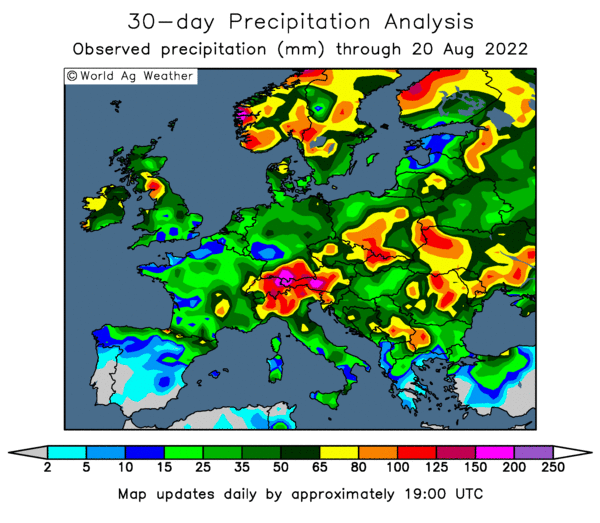 According to the Buenos Aires Cereals Exchange rain in the last ten days or so may have arrived just in time to help soybeans, but for sunflower it's all too late. The crop is already 14.1% harvested they say, well ahead of last year, and results so far have been "disappointing" they say. In Buenos Aires, Cordoba and La Pampa farmers have started harvesting early with plants stressed by lack of rainfall and soaring temperatures. The exact extent of crop losses so far remains unclear. What we do know is that last season's crop of around 4.5-4.65mmt never stood a chance of being matched with plantings down by around a third. The USDA say just 1.73m hectares went into the ground this season, 34% lower than last year. If we call last season's crop 4.6mmt, then that gives us production of around 3mmt this time round, without factoring in worse weather than last year. The only year in recent history that Argentina had a crop that low was in 2000, when production plumbed to 3.05mmt. The Argentine Agricultural Secretariat says that production this year will be "2.5-3.0mmt" and the USDA currently say 3mmt. Neither of these figures seem to take into account the Buenos Aires Cereals Exchange's comments Friday that early yields are coming in 45% down on last year. A crop reduction of that magnitude across the entire country would suggest final output of just 1.65mmt. Which ever way you look at it, it seems that this season's sunflower crop is going to be the lowest for many years, possibly down to the 2-2.5mmt region. Argentina typically exports around 300-350,000mt of whole sunseeds every year, in 2000 - the only year that production fell to the kind of level we are looking at here - exports were just 79,000mt.